} A 1800 g preterm (36 weeks) male was born to a G3 mother by NVD. The baby cried immediately after birth and there was no perinatal asphyxia. 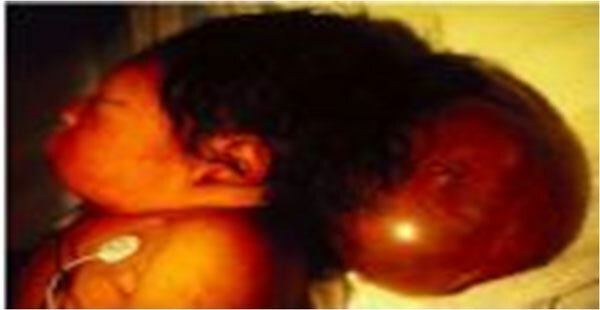 Soon after birth the baby developed respiratory distress with mild cyanosis. Attempts to pass a nasogastric tube through the nose were un-successful. Esophageal atresia was ruled out by passing an oro-gastric tube. A provisional diagnosis of bilateral choanal atresia was made.
} Routine laboratory investigations were normal. The chest X-ray and X-ray naso-pharyngeal region lateral view did not show any abnormality. Ultrasound cranium was normal. 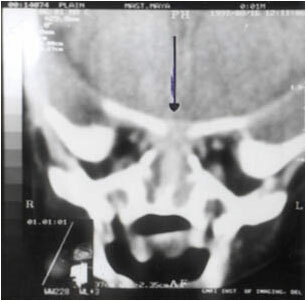 A CT scan of the paranasal sinus region and skull showed a bony defect in the floor of anterior cranial fossa in the region of the cribriform plate with brain parenchyma extend-ing into the nasoethmoidal region (Fig.). These findings suggested the diagnosis of trans-ethmoidal encephalocele as the cause of nasal obstruction.
} bony defect in cribriform plate and protruding brain tissue (arrow).
} Encephaloceles have a multifactorial etiology, and genetic and geographic factors have been implicated. Frontal encephaloceles are far more common in the Far East, particularly in the Chinese population, and are associated with a more favorable prognosis.
} Encephaloceles occur more commonly in females than in males.
} Currently, most encephaloceles are diagnosed prenatally and present at birth., Some, particularly sphenoidal encephaloceles, may become apparent later in childhood.
} Transethmoidal encephaloceles (TEE), a subtype of basal anterior encephalo-cele, is the protrusion of a part of brain tissue through a bony defect in the cribriform plate into the anterosuperior nasal cavity.
} Naso-frontal, naso-ethmoidal and naso-orbital or combination of these.
} Frontoethmoidal encephaloceles :commonest type, followed by the nasopharyngeal and orbital type.
} 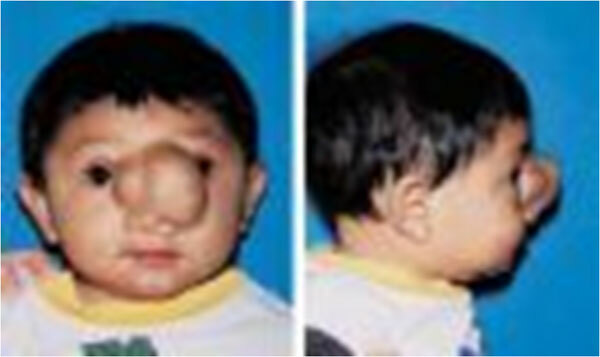 The nasopharyngeal type remains occult and presents with nasal obstruction or CSF rhinorrhea. Rarely, the patient may present with meningitis.
} The aware-ness of this lesion in differential diagnosis of choanal atresia is of practical importance because failure to recognize this lesion can lead to surgical misadventure. The advent of CT scanning and MRI has made the diagnosis simple. These scans help to delineate the extent and characteristics of the anomaly.
} The aim of surgery is to excise the encephalocele, repair the dural defect and correct the facial and orbital deformity. The ideal age for surgery is around 6-9 months. Early surgery leads to better cosmetic results and prevents CSF leak.